Medical group Asklepios to which the Asklepion-Gauting - one of the three largest private health concerns in Europe, which owns 150 hospitalsand medical institutions (including - a network of acute care hospitals, rehabilitation clinics, health centers, ucherezhdeny Nursing) which is held annually around 2 million treatment. patients. Asklepios Clinic - an innovative medicine for all. Asklepios - Gauting - is the center of Pneumology and Thoracic Surgery. 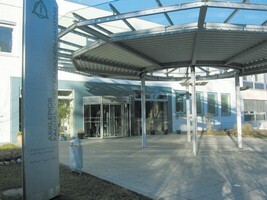 The clinic is the largest specialized center pneumological Germany (268 bed places). The clinic consists of 8 offices are treated each year about 10 000 patients. The clinic is the training base of the Munich Ludwig Maximilian University and belongs to the Research Foundation Comprehensive PneumologyCenter (CPC). One of the strengths of this clinic is faster and smarter diagnostics, which is implemented through the joint activities of departments of radiology,pulmonary pathology, nuclear medicine and laboratory center. Thanks to highly qualified staff of clinicians, the use of scientific innovation, modern technical equipment and proper nursing clinic -GautingAsklepios is one of the leading places on the success and effectiveness of treatment of patients with pulmonary pathology in Germany.